Theme: God’s faithful and generous people are aware of the brokenness and polarization in our world; they work prayerfully to mend rifts and find a way forward in unity. What does the acronym A.C.T. stand for? People from many faith bodies, including ELCA Presiding Bishop Elizabeth Eaton and many synodical bishops, attended, along with a number of my colleagues in ministry. There seems to be a will for unity and a desire for all people to have equal seats at the table. There is also, and rightly so, a gnawing frustration and sense of despair that we as a nation have not come further in 50 years. 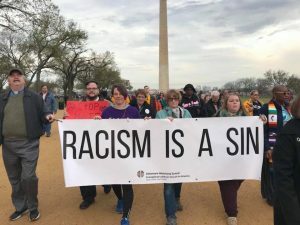 For those of us who were not able to travel to D.C. for this event but who care deeply about healing racial, ethnic, socio-economic, and political rifts that also fracture the Body of Christ, one of the most important things we can do is let the lessons of scripture speak to these issues when they present themselves. This Sunday is one such occasion. How one approaches the sin of systemic racism, the abomination of poverty in a land of plenty, and the way our country is sorting itself into like camps and entrenched positions will be highly contextual. It demands the trust of those with whom we serve, and it means always making sure that the truth is told clearly but is also wrapped in love. That said, how can we choose silence when scripture speaks? Pray, dear preachers, that this week’s readings will open up paths to address the hard issues of racism in our culture. This week’s gospel lesson is familiar; in summary, the disciples are huddled in a locked room bound by fear. Jesus enters and breathes peace on them. Thomas isn’t there at the time, and when he shows up later he wants proof. Jesus meets him where he is and gives both proof and peace. The first lesson, from the Acts of the Apostles, tells the story of what happened when those early disciples gathered their courage through the Holy Spirit to share the good news. The church was on fire! People were living lives of joyful community, sharing, and mutual support. The apostles were boldly testifying. Unity was the norm, and people began to notice the difference in this group of Christ followers. The message we hear from 1 John is one of unity in the light of God. There can be no darkness where God is present. If we walk with God, we walk in the light, we are cleansed from our sin, and we have fellowship with one another. Again, hear the undercurrent of unity in this passage. Psalm 133 affirms succinctly this message of unity and God’s desire for us to live this way. It’s always a good time to be God’s people, and now is the time to preach unity in the amazing diversity of God’s good creation. Let us preach a message of hope, with a challenge to act in the same mind as Christ, encouraged by the model of the early church, and inspired by the truth and light of scripture. Concerned about how your words will be received? Pray into it, my friends. Trust the Holy Spirit to guide you. Love your people where they are and nudge them into God’s preferred future and inbreaking reign. My prayer is that you and I will be bold in love, speak a prophetic word in truth, and trust God to guide all of us. Now is the time; there is no better one. A growing practice among Christian congregations is to recapture the ancient tradition of “Bright Sunday” or “Holy Humor Sunday” for the Second Sunday of Easter. No one should die from terminal seriousness — especially not in the church. Consider how you might begin to incorporate elements of this practice into your own community’s worship. Start simply with joyous hymns, bright energy, and a few good jokes. For more ideas and information visit https://www.joyfulnoiseletter.com/hhsunday.asp. Explore with youth the concepts of “proof” and “mystery” in light of this week’s gospel story. What “proof” do we need today? Are we willing to live with and embrace “mystery”—something that requires living by faith? Alternatively, involve your youth in Holy Humor or Bright Sunday worship. Have them tell jokes (check our SOLI archive), dress up, or lead an impromptu skit if you have actors in your group. We are stronger together, and unity brings us together. Talk with the children today about the message of Psalm 133 and how God is pleased when our faith communities and families are united. It doesn’t mean that we all have to look the same or think exactly the same. Rather, we bring our own unique gifts and talents together to make a real difference as Christians. To illustrate this principle, have each child pick three strands of colorful ribbon, yarn, or embroidery floss (18-24 inches is long enough for each strand). 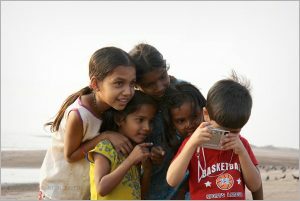 Have the children hold the strands together, tie a knot at one end, and then braid the strands. Affirm their choices and have them notice how colorful and different the braids all appear. Remind them that these woven strands are stronger than a single strand. Their choices are as unique as they are, but woven together they work together for a common purpose—strength and unity in their diversity. Now, ask them what would happen if we wove or braided all of their strands together? Would they be even stronger? More colorful? This is how God hopes that we will be—unified in our diversity, working together as the family of God, the Body of Christ to be a strong and faithful witness in the world. Finish with a simple prayer. 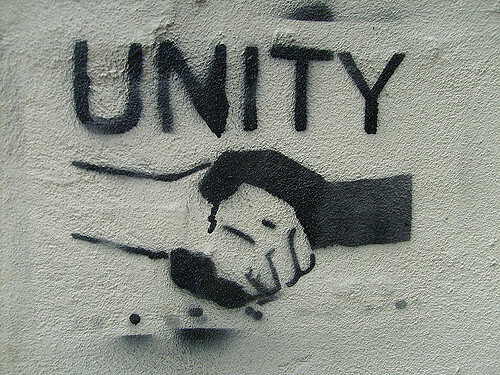 Is seeking and practicing unity an act of stewardship? Absolutely! When we value one another and all of God’s beloved people we are being good stewards of God’s good gifts—each other. Consider how you can listen and learn from those who are different from you or who hold different views. How might you share your own experiences and perspectives in a spirit of love and mutual respect? Are you willing to make holy space for all people within your faith community? This week consider ways that you can work for justice and combat racism and poverty. The issues are complex, but if we all take small actions and commit to change, then we can move toward the unity we read about in Psalm 133. Pray that God will guide you to one simple action every day. Perhaps it is calling attention to a racist practice or questioning inequities in fair housing and hiring practices. Maybe it’s reading a good book on the subject (Click here for a list of good possibilities for adults and here for a list for children.). You may want to write to your elected officials or join an advocacy group. A journey is made up of many steps. The key is to begin and to trust the Holy Spirit to walk with you. Photos: Thomas Kohler, Norma Malfatti, and Nevil Zavari, Creative Commons usage license. Thanks!